I’m getting ready for the arrival of tour number three for this season. Rudy and Shirley Rice, Devon Kruger and Phyllis Goble will be arriving in Frankfurt on the 24th to start their Grand Adventure. 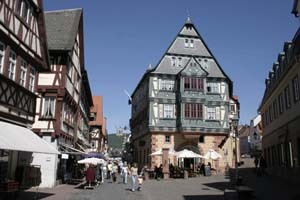 We’re going to start in Miltenberg am Main (shown above) with two nights at the venerable ‘Riesen’ hotel. This hotel has been welcoming guests since the 12th century. The current structure dates from 1590. From Miltenberg we go to Bacharach on the Rhein, then to Romantic Rothenburg ob der Tauber in time for the closing festival day of Pfingsten. Down to Meersburg on the Bodensee for a night before we cross into Switzerland for three nights in Weggis on the Vierwaldst?§ttersee. Then one of the most beautiful alpine drives in Europe as we make our way to Berchtesgaden for three nights at one of my favorite country inns. I must remember my swimming suit because their pool has an awesome view of the alps. We wrap up the trip with a visit to Salzburg and then a final night in stately Landshut near the airport outside of Munich. Two weeks featuring some of my favorite places. Stay tuned for more details from this exciting trip.